Successfully Added 8 Ultrasonic Sensor Parking System - 2 Inch LCD Display, Audio Alert, 0.3 To 2.5M Detecting Distance to your Shopping Cart. This advanced parking assistance system uses 8 ultrasonic sensors to help you park with ease helping you avoid bumping into objects, other vehicles and even children. The proximity detectors emit acoustic pulses and are able to detect the reflected signal which are used calculate objects with great accuracy. All the sensors have secure fittings and are marked up with corresponding tags to match the control box, this will make it quick and easy to install the sensors into your car or truck, there is even a hole saw bit to help mounting them in the front and rear bumpers or your motor vehicle. With 4 reverse parking sensors this system will guide you as backwards as you reverse into any parking space and alert you to any objects between 0.3 and 2.5 meters away so you can see and avoid obstacles even if they are hidden in your blind spots. Additionally there are 4 front sensors that operate between 0.3 and 0.8 meters so low walls and bollards won't be an issue again. With a audio detection indication and a 2 inch LCD screen you get a visual display showing how close objects are as well as acoustic tones that indicates if your too close to objects when maneuvering. 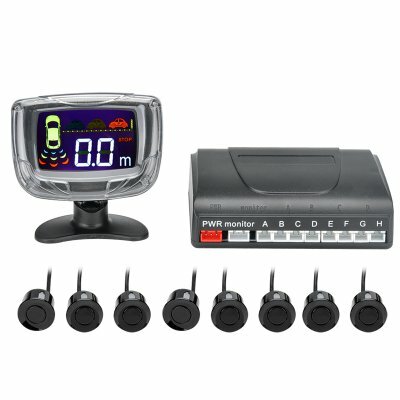 This 8 Sensor Parking System comes with a 12 months warranty, brought to you by the leader in electronic devices as well as wholesale car gadgets..